Jeff Lobb, co-founder of SparkTank Media, has spent more time on stages across real estate events over the past five years than most. 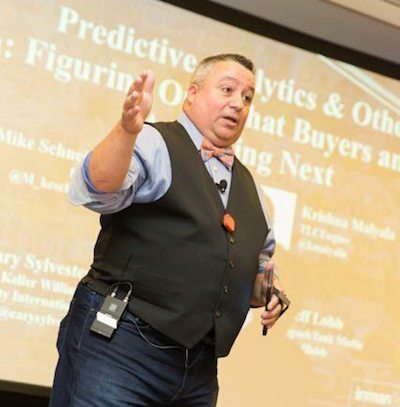 Between moderating critical conversations to keynoting leading technology conferences, Lobb consistently over-delivers from stage with a message that is engaging, actionable and memorable. With Inman Connect San Francisco around the corner, we caught up with Jeff on how anyone can take their presentation skills to the next level. Whether it’s a listing presentation or a keynote address, Jeff shares three keys to delivering a presentation that gets results. Jeff Lobb is hosting a brand new event for speakers who know that great presentations mean bottomline business results. Agents, brokers, consultants — whether they’ve given one talk or hundreds — should attend DELIVER! SparkTank Media’s Exclusive Speaker Conference, May 16-17 in New Jersey, to turn their presentation skills into an essential business asset. Enjoy our Q&A with Lobb on what matters most to creating a standout presentation. Inman: What are the biggest mistakes people make when delivering a presentation? Jeff Lobb: People have a tendency to make a few key mistakes when delivering presentations. One of the serious mistakes I see people make is not knowing their content. I mean really knowing it cold. Being truly prepared gives you a foundation of confidence. What happens when there’s a lack of confidence — it causes a domino effect. The nerves get fried, and then the second guessing starts. That creates an awkwardness that the audience feels and that turns into a lack of credibility and connection with the speaker from the audience perspective. But the biggest mistake I see is when people don’t realize that their next big opportunity might be with someone who might in the room. Every person is a potential customer, or knows someone who may become a resource for you. Whether it’s a small group like a couple at the kitchen table over a listing presentation, or from a big stage in front of 2,000 [people], so many potential opportunities are lost when people don’t take the opportunity seriously. Prepare. Prepare. Prepare and deliver. What is one small change that people can make to their talks that makes a huge impact? Slides. I can’t say this enough. Sounds simple, but way too many people rely on their slides during a presentation. Too many words, too much info on the screen. They become a script of sorts, instead of what they should be — which is the CliffsNotes version. Just the highlights. When you make the slides the focus of your presentation, what happens when the slides don’t work, or computer goes down? Can you continue without missing a beat? What are the essential elements of a great presentation? The essential elements of a great presentation are preparation, content and delivery. Being clear and concise with your message, while fully engaging and understanding your audience is key to any successful sales opportunity, and it’s the same for the big stage. When you walk out of a pitch, or off of a stage, you want your audience to have felt your message. That’s how you deliver. What will attendees learn at DELIVER! SparkTank Media’s Exclusive Speaker Conference? Deliver is a bootcamp for people looking to improve their ability to deliver compelling presentations, keynotes, sales meetings or sales pitches that connect with their audience and maximize every opportunity. The prep before the presentation. Knowing your audience, prepping your slide deck, getting focused. Knowing the content, even when something goes wrong. Being comfortable and confident starts with how you present yourself. Understanding timing and stage presence. How to capitalize and work your audience when you aren’t onstage. Click here for more information and to save a spot at DELIVER! SparkTank Media’s Exclusive Speaker Conference.